Embracing Change > ThinkuKnow Scouting? In September 2010, The Scout Association commissioned an independent research company – Public and Corporate Economic Consultants (PACEC) – to conduct an Impact Assessment of The Scout Association. 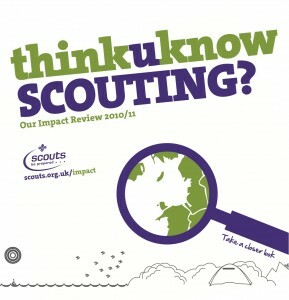 This was to measure the impact and benefits of Scouting on its young people, its volunteers and its wider communities. The research draws on a substantial body of evidence following surveys with over 2,500 people. The research team consulted and engaged with 260 Scout volunteers, almost 800 Scouts (aged 10-25), over 600 former Scouts,100 young people not involved in Scouting, and over 800 external organisations including voluntary and neighbourhood groups, public sector organisations and the private sector. This report highlights how the nature and scale of Scouting brings significant personal and professional development opportunities to its 500,000-strong membership, as well as how Scouting’s attributes and activities provide considerable benefit to employers and local communities. The Scout Association especially thanks its 100.000 volunteers for their commitment. Milutin comes from Serbia and is a Director of Adult Resources at European Scout Office. He is following the Region's work on Educational Methods and Volunteering.